The Internet is an ever-growing place. No matter how many new sites are coming everyday, still popular sites are shining in millions of other sites. Web is constantly changing. So it is not easy to keep track of which sites have best resources and content. Don`t worry I am here to help you. Today I am sharing a list of the best websites on the Internet. These websites are very popular and genuinely useful. These are top-of-the-line sites. I will keep this list updating periodically. 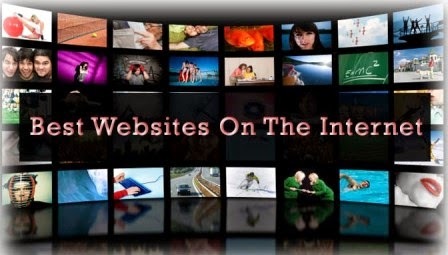 Now let`s see this list of best websites on the Internet. There is no doubt that Google is No 1 and best websites and search engines on the Internet. In past years Google is spreading it`s wings all over the world. Gmail, Blogger, Google Plus, Google maps, Android, Apps, Google is becoming the necessary part of our lives. When we have to find something we search on Google, When we need direction to reach somewhere we search on Google, google is one of the most effective site and search engine which impact decision making of people around the world. Like Google, Facebook also do not need any introduction. Facebook is one of the best websites on the Internet. Facebook is not only the biggest social network but also one of the online business tool to grow social marketplace online. Facebook allow you to add friends, chat, share your thoughts with the world, create business pages and grow your audience or followers. Now facebook also going to launch money transfer feature, which will help you in many ways. Facebook is the world`s biggest online social place. Do you like videos? I like videos very much, actually everyone like videos. Youtube is world`s no 1 video sharing website on the Internet. You can create videos and share on YouTube. You can not only share personal videos but also share educational videos. people around the world learn so much from the videos. Youtube is not only for education but it is the biggest source of entertainment. you can watch songs, serials, movies and much more. Youtube also allow you to make money by uploading and sharing your unique videos. If you are an online shopper, then you definitely have heard about Amazon. Amazon is world`s biggest online marketplace and no 1 book seller. You can buy almost anything that you are looking for on Amazon. Amazon provide best deals which help you to save money. Amazon also allow you to make money by selling products online or promoting Amazon products. Ebay is also one best websites on the Internet. It is also known as the garage sale of the world. With the rise of so many other popular sites it feels a decrease in popularity, still you can get best deals on Ebay. Netflix is a best entertainment website on Internet. It is said that around one third of all Internet packets are Netflix packets. You can join Netflix at $8.99 a month and then you can watch lots of movies, documentaries and TV shows. You can also rent movies from Netflix. Hulu Plus is another very popular entertainment website on Internet. You can take it as younger brother of Netflix. Because of less subscription fees and ads, Hulu Plus attract some clients that Netflix can’t. Do you worry about spending money on watching a worthless movie? Don`t worry Rotten Tomatoes is here to help you. Rotten Tomatoes is a best review website on internet. It has number of reviews. You can look for the reviews before going to watch a movie. These websites are great, but I barely scratched the surface, I believe there are lot many sites that need to be included in the list of best websites on the Internet. Which are your favorite websites? Get your favorite site included in this list? Do share via comments.